Pembroke Castle (Welsh: Castell Penfro) is a medieval castle in Pembroke, West Wales. Standing beside the River Cleddau. 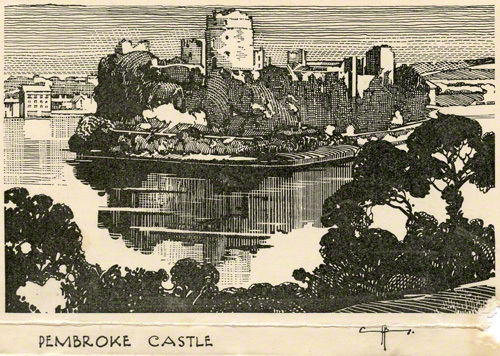 The castle is sited on a strategic rocky promontory by Cleddau Estuary. Claude Buckle realistically captures the scene in his 1935 pencil drawing. An enormous oval castle, mostly surrounded by a serene mill pond. Extensively restored in Victorian times, it's dominated by the complex gatehouse on the outside and the huge circular keep once you're inside. 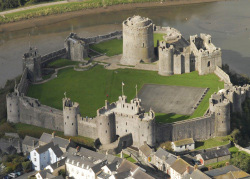 The walled town of Pembroke which grew up around the castle also contains many ancient and interesting Norman buildings. View from the north. Created in 1935. Arial photograph looking from the south east.